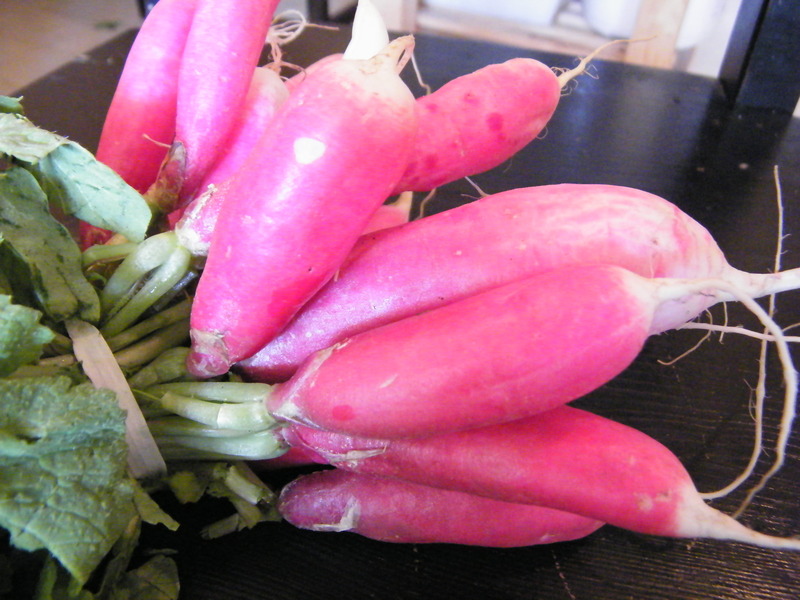 Breakfast Radishes | What is That and How Do I Eat It? Nuh-uh. Me neither. 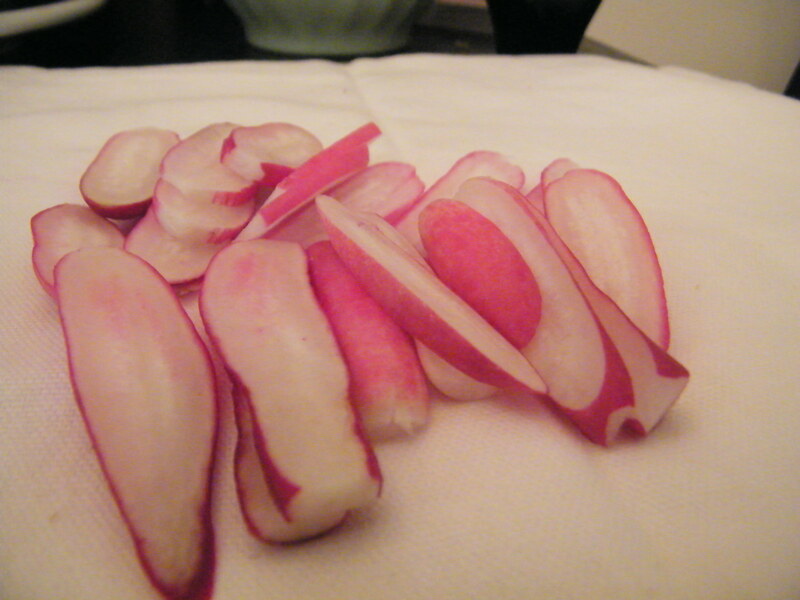 But I didn’t think I liked radishes particularly until I tried these babies. 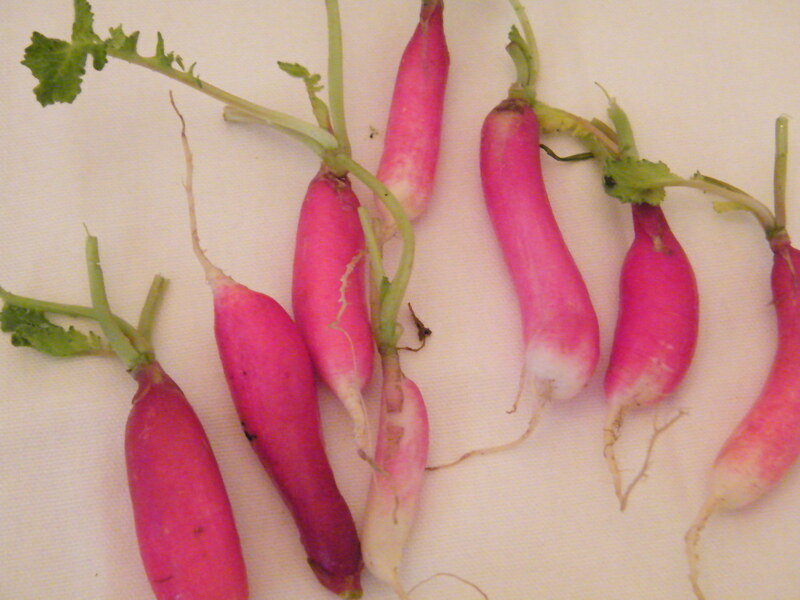 Radishes come in a lot more varieties than I ever gave them credit for. I always thought of them as the little red spheres that Peter Rabbit got in trouble for and that cafeterias thinly-sliced into cheap salads, and they are, but it turns out they come in white and purple and in between – watermelon radishes are whitish-green on the outside and red in the center – and in spheres and oblong and big like cucumbers, and that’s not even including varieties like daikon and other Asian relatives. If the only kind that you’re familiar with are the little red salad spheres, you probably think of them as crunchy, spicy, and a little useless, and in general I agree. 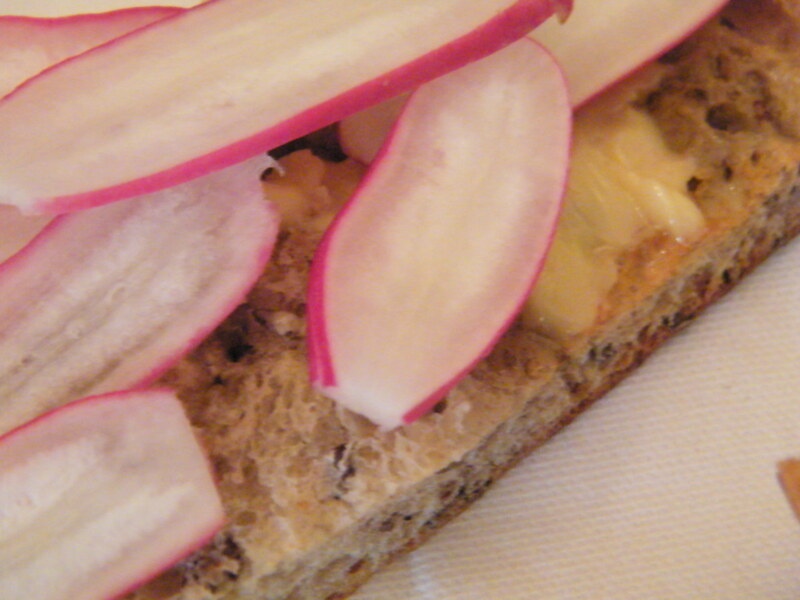 Breakfast radishes, on the other hand, are lovely. They’re smaller and oblong, red from stem almost to the end where they are daintily tipped in white. Look for ones with nice healthy greens attached. They should be firm, and the smaller the sweeter, though the teeny ones rot faster. When they start to turn, they get squishy from the inside out, so the middle will cave before the ends will shrivel. Good ones look and feel a lot like small fingers. Sorry, but they do. If one of them grazes you while sticking out of your straw bag, you’ll jump a foot into the air. It’s creepy! Or maybe I’m just jumpy. But they’re not nearly as sharp-tasting as the supermarket variety, which gives them a fresh, watery flavor – like a pickle without the vinegar. They have a nice subtle bite so that something’s going on, but if you cook them down, it’s slight enough that it will practically disappear, which can be good when you have too many in the fridge that you don’t want to waste. Think very, very mild horseradish. T hey really shine, however, in simplicity. Chop them into chunks, drizzle with olive oil and chunky salt, and eat them with your fingers while you sit on the porch on a warm evening with a glass of wine or beer. Or slice them thin, layer on really excellent bread spread thick with a good butter and sprinkle very lightly with salt. That’s it. Cream cheese? Unnecessary. Spices? Not here. Just crispy, crunchy deliciousness that tastes exactly like Spring should taste. Trim? Trim off the root hairs or the really spindly long root at the end, and take a little off the top. If you’re saving the greens, chop them off about 1/2 inch from the root as soon as you get them home – they’ll continue to feed the radish and will wilt faster. If you’re not saving them, leave them on to help the root stay fresh a little longer. Edible when raw? Yes. Best when raw, in my opinion, though cooked can go in almost anything as filler. Worth the price of organic? Probably, and easy to find if you don’t mind them looking a little ugly. 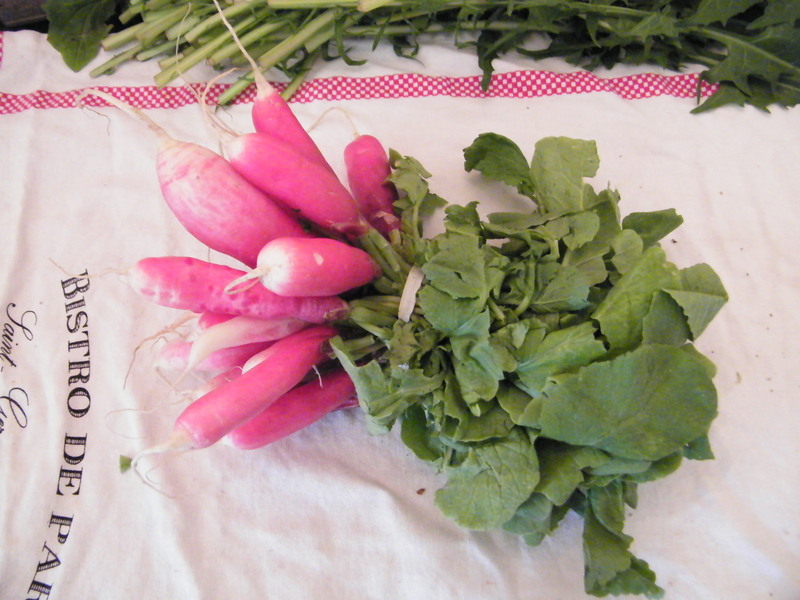 Radishes are one of the key “trap crops” used by organic farmers to lure bugs away from more desirable fare, so plenty of growers have radishes by the bushel-full…Trouble is, they’re trap crops. They’re gonna look a little worse for wear unless the farmer is doing something to protect them better. Ignore the bug holes and chomp away! In season: Spring. 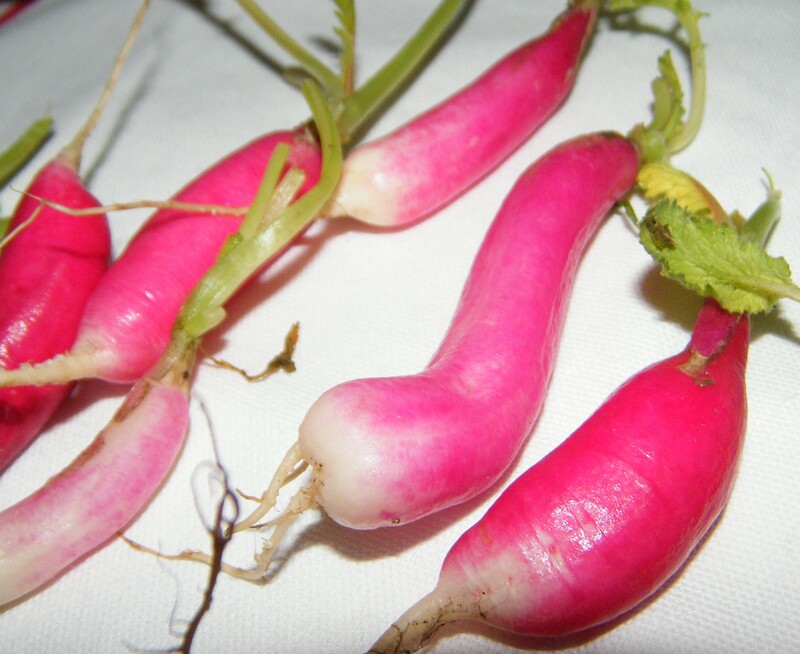 Radishes like a cold snap- it makes them sweeter- and they’re usually best when dug up before the soil gets too consistently hot. In L.A., I don’t like to buy radishes much past June unless we’ve had a very mild Spring, but in the rest of the country you may be good straight through until August. Best with: almost nothing – a little oil or butter, a little salt, and nothing else to compete. How to Store: In the fridge they’ll keep a week or longer, but they will get squidgy about the edges or soft in the center if they go too long. If they’re no longer firm but not really soft, toss them into any sort of stir-fry/saute-type meal and they’ll cook down and taste just fine. Farmers’ Market find or can I pick them up at Whole Foods? Whole Foods should have them as well; they’re pretty popular, I think.